Sports drinks are something that I love to have around the house. The boys drink them during and after tball and I love to drink them often. I was never a fan of the added dyes and artificial sweeteners used but I liked the added hydration and, to me, that seemed important. A couple weeks ago I was contacted and asked to give BODYARMOR SuperDrink™ a try. I was really excited when I read about the ingredients. 'All natural sports drink, yeah, that can't taste good' I thought. When my package arrived nothing could have held me back from trying them. I was eager and anxious. I ripped the package open and to my excitement, there were many flavors to choose from. Grape, Fruit Punch, Tropical Punch, Orange Mango, Strawberry Banana, Mixed Berry and Lemon Lime, how ever could I pick 1 to try first? Luckily we were on Spring Break so the kids were home and equally eager to try them. Dexter picked Orange Mango, Oliver choose Strawberry Banana and I chose Tropical Punch. It was love at first gulp sip. The boys were so delighted in their choices that it was hard to get their little paws off the bottles in order for me to sample the deliciousness inside. The only flavor that I was sure I wouldn't like turned out to be my favorite; Strawberry Banana!! I really liked all the flavors A LOT but my other favorites were Tropical Punch and Orange Mango! I have tried coconut water before and was never really impressed with it. I am not sure the magic behind the SuperDrink™ but I do know that they are miracle workers because they made something that is usually so drab into something very fab! The kids didn't get a chance to bring any to Tball since we liked them so much that we drank them in 2 days. Jason got the Lemon Lime and he was very happy with it. In fact, he said that he was going to want that next time he gets sick instead of the kind he usually requested. In the true effort of research, I thought it would be a good idea to drink a lot of some wine and try Body Armor the next day. Well, my plan was a success. The morning after a late night of cribbage, wine and movies with Jason, I woke up with a slight headache and I was definitely parched. 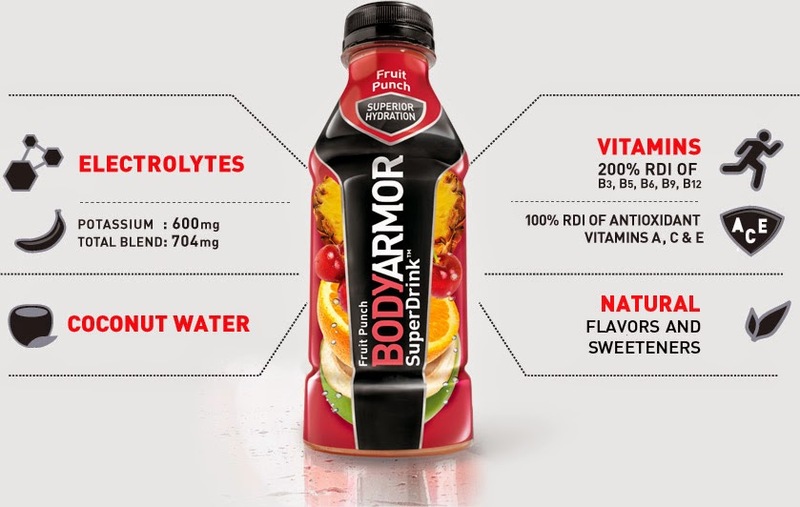 I grabbed a bottle of BODYARMOR SuperDrink™ and I was back to 100% by the end of the bottle! Do I think that I will be purchasing more of this stuff? OH HECK YEAH--I already have! They sell it at TARGET!! Once the kids got back to school and I was armed with my newly purchased BODYARMOR, I brought along a few bottles to Dexter's first Tball game. A few parents asked to read the label and all of their responses echoed similarly "Wow, I've never heard of this stuff!" "Theres no junk in there!" "Is it good?" Once I tossed them a bottle to share, the conversation quickly changed to "We are hitting up Target on the way home!" FINAL LINE: I have reviewed A LOT of products on Super Savvy Mommy over the last 6+ years but this is in my TOP THREE things I have ever reviewed. I LOVE this product so much and would be honored to work with them anytime! Got the coup and I'll give it a try! Top 3?! It must be pretty good. I've never heard of this brand before, nor have I seen it in stores. I'll keep my eye out for it! I like the wide range of flavors! Love that this is made with coconut water. Sounds like it would be really delicious. I recently saw this at Kroger and thought about getting some for my husband and daughter to drink while at karate during the week! Thanks for the coupon - I will have to pick them up! I totally need to try these. Thanks for the heads up! Love all the flavor options especially.